The ice cream truck is synonomous with fun and features in most people's happy childhood memories. Eddie Murphy created an incredibly funny and now famous comedy sketch based on his ice cream memories as a kid. Even today when our local ice cream man comes around, the queue is comprised of people of all ages, young and old. However, that could soon be a thing of the past ... in Britain. According to news reports, 3 January 2012 will be a key date for ice cream truck owners and operators. This is the date by which they will have to ensure that their vehicle(s) comply with strict quality air standards as set by a 1996 EU directive. The law is already in existence applying to trucks, buses and coaches and is in force in boroughs of London in England. However, this legislation may soon be in force not only in other cities throughout Britain but also be extended to cover smaller commercial vehicles such as minibuses and ice cream trucks. Many ice cream truck owners/operators simply don't have the financial resources to comply with this proposed legislation as they would need to either replace their vehicle(s) entirely or at the very least fit expensive specialised filters. And if they don't they face a heavy fine - again something they cannot really afford. 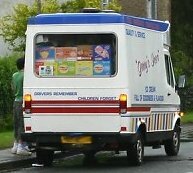 It would be a sad day indeed if the ice cream truck disappeared from the streets of Britain. After all, we're not talking about just a business here .... it's a community service!